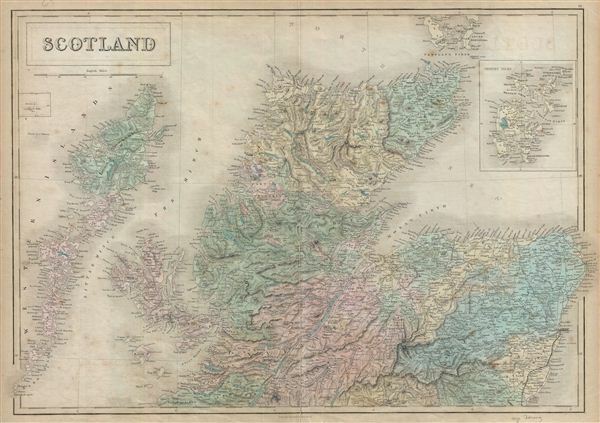 A fine example of Adam and Charles Black's 1851 map of northern Scotland. The map covers the northern part of Scotland from Blair Athol to the island of Hoy (part of the Orkney Islands) in the north. An inset map on the upper right quadrant details the Orkney Islands. This map was issued in the midst of Scotland Industrial Revolution, in which it emerged as a regional center fo engineering and shipbuilding. In 1843, against the backdrop of the Industrial Revolution, during which Scotland flourished, the Church of Scotland witnessed a division in which many of its ministers, following a decade long conflict, broke away to form the Free Church of Scotland. Throughout, the map identifies various cities, towns, rivers, lakes, roadways and an assortment of additional topographical details. Map is hand colored in pink, green, blue and yellow pastels to define boundaries. The map is issued as plate no. 9 in Black's General Atlas. Rumsey 2305.017 (1854 edition). Philips (atlases) 4334.